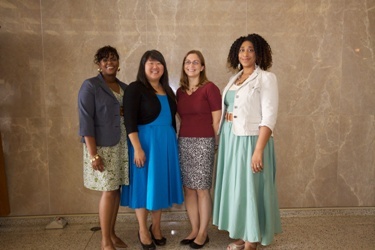 After spending a year at the National Library of Medicine, the 2009-2010 NLM Associate Fellows are moving on. Three are starting the optional second year of the program, and one has taken a full-time job. The Associate Fellowship program prepares librarians for leadership roles in health sciences libraries and health services research. Here’s where you’ll find the 2009-2010 Associate Fellows in the coming year. Ada Cornell joins Inova Fairfax Hospital Health Sciences Library, in Falls Church, Virginia, as a medical librarian. She came to the NLM from Syracuse University after earning her Master of Science in Library and Information Science (MSLIS) degree in May of 2009. MaShana Davis is spending her second year at the National Institutes of Health Library on the NIH campus in Bethesda, Maryland. Davis received her Master of Information Management degree from the University of Maryland, College Park, in 2007. Yani Yancey is spending her second year working in community outreach programs in Baltimore at the University of Maryland, Health Sciences & Human Services Library. She received her MLS from the University of Maryland, College Park, in August, 2009. Holly Zerbe is spending her second year at the Yale University Cushing/Whitney Medical Library. She received an MLIS from Drexel University in the spring of 2009 with a focus on special collections and archives. Between the beginning of January and end of August, a number of people at NLM have moved on or moved up. Congratulations to the people who’ve recently retired or been promoted after years of service to the Library. Terry Ahmed was appointed head of the Reference and Web Services Section, Public Services Division, in February. He had served as head of the User Services Unit, managing all aspects of a busy customer service desk, including its supporting contract activities. He also managed reference services in the main Reading Room. Prior to coming to the NLM in 2001, he was customer services project manager for Betah Associates. He received his master’s degree in library science from the State University of New York at Buffalo and his undergraduate degree from Buffalo State College. Charles Sneiderman retired in May after 30 years as a research medical officer with the Lister Hill National Center for Biomedical Communications. He was president of the Federal Physicians Association from 1990 to 2000. He received a performance award from NLM for the development of an employee volunteer program to offer CPR with AED in the workplace (the first such program at NIH outside the Clinical Center). Awards outside NLM related to his research include election to Sigma Xi and the American Academy of Family Physicians Outstanding Scientific Exhibit for an interactive video lesson on the Bethesda system for cervical cancer screening. Dianne McCutcheon, Chief, NLM Technical Services Division, retired in July. She came to NLM as an Associate in 1978, became a systems librarian here in 1979, and began compiling a distinguished record of service. Much of her career was spent at NLM with the exception of time with the Library of Congress and Kaiser Foundation Hospitals. She authored several publications and received several honors including the Frank B. Rogers Award, the National Partnership for Reinventing Government “Hammer” Award, and the NIH Director’s Award. Bernadette Vauss, administrative assistant in the Preservation and Collection Management Section, retired in July after nearly 43 years of service with the NLM. Over the years, she contributed in many areas of Library operations, including the photo duplication section, History of Medicine, Reference, Collection Access, and, since 1990, the Preservation and Collection Management Section. Alvin Harris, Deputy Chief of the Office of Administrative and Management Analysis Services, retired in July after 31 years of service at NLM. As Deputy Chief, he was responsible for supply functions, shipping and receiving, emergency management, building services and several other areas. He started as a supply technician in 1971. Catherine Selden retired in August after 18 years with NLM. She was a librarian in the National Information Center on Health Services Research and Health Care Technology (NICHSR). She was the project officer for NLM databases HSRProj (Health Services Research Projects-in-Progress) and HSRR (Health Services Research Resources) databases. She also coordinated the development of HSR Information Central, a portal to resources for the users and producers of health services research. She won an NIH Merit Award. She is the second person in her family to work at NLM. Her father, Charles Roos, retired as the Reference Section Head in 1967. If you would like NLM in Focus to include someone in your area in “NLM Names in the News,” please contact the editor at publicinfo@nlm.nih.gov. Thank you. Photo Caption: Pictured from left to right: MaShana Davis, Holly Zerbe, Ada Cornell, and Yani Yancey.